On 1st July, 1867 Confederation united the country’s first three provinces of Nova Scotia, New Brunswick and Canada (including Ontario and Quebec) into a federation known as the Dominion of Canada. Now, a hundred and fifty years later, the country is celebrating that date with a year long party of events and commemorative memorabilia. 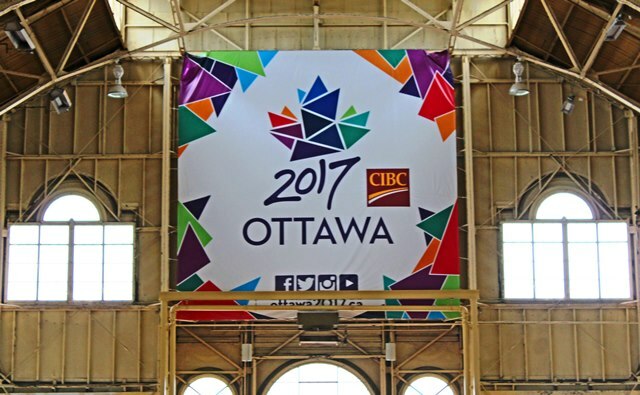 I recently spent a week in the capital, Ottawa, where the whole city was en fete and getting ready for Canada 150 in colourful style. I will be writing about my trip in more detail later, but in the meantime, here are a few images from Ottawa that sum up the beauty, diversity and history of Canada. 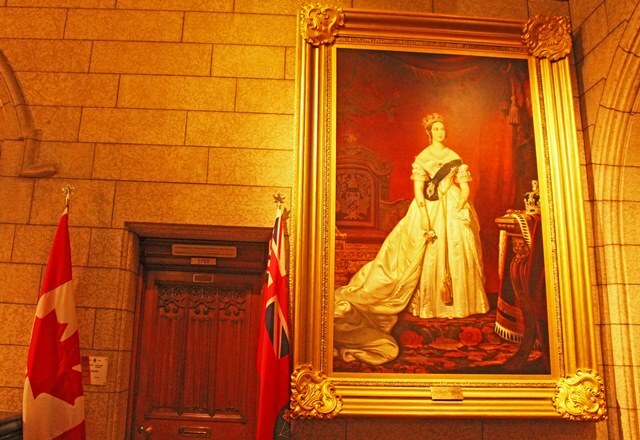 This glorious portrait of Queen Victoria hangs in Canada’s Parliament Building, reminder of the country’s strong ties to Great Britain and its historic past. The portrait has survived numerous disasters including fire so it’s clearly a survivor. Take a tour round the building; our guide told us it was her favourite painting there and that no-one knows who painted it. 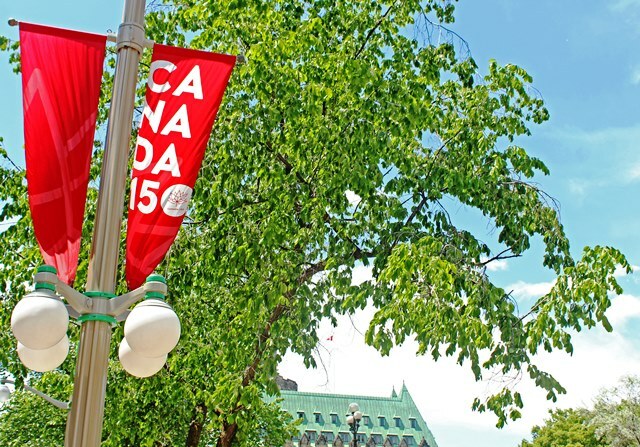 Parliament Hill is the focus of the main Canada 150 party held on July 1st, as well as the annual Canada Day celebrations. Wander round the grounds and spot the many statues and artworks that celebrate its fascinating past. When I visited, there was a great deal of work being done in preparation for the big day, as well as a lot of renovation work. It’s a meeting point for locals and visitors who enjoy walking round Parliament Hill as well as relaxing on the lawn. NB. From 2018 the main Parliament Building is closed for at least 10 years for total refurbishment. Find the ‘Anishinabe Scout’ made by Hamilton MacCarthy in 1918. 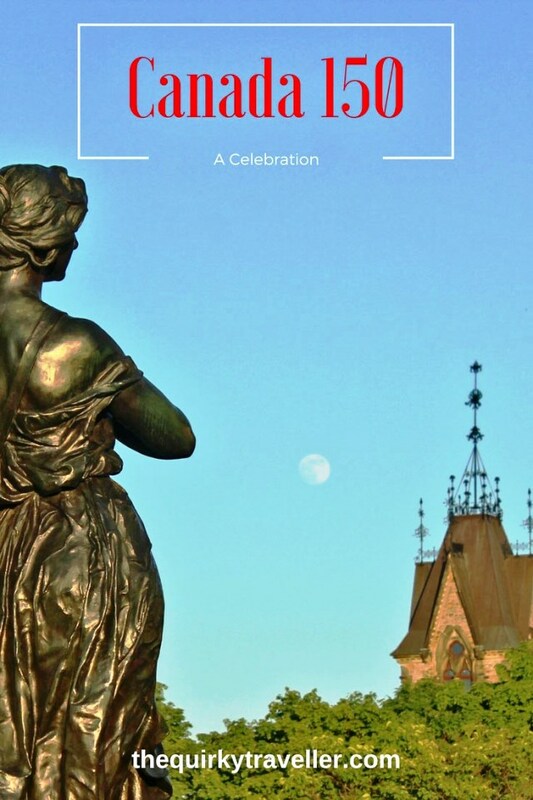 It stands opposite Parliament Hill overlooking the Rideau Canal and Ottawa River. 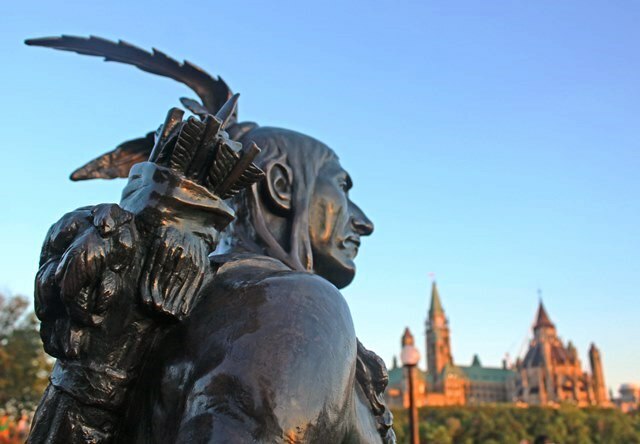 It represents the First Nations people who helped in the development of Canada. All round the city there are many excellent sculptures, some dating back to the 19th century and others very contemporary. This is the stunning Main Hall in Canada Museum of History. The museum is actually in the city of Gatineau, over the river from Ottawa, but feels very much a part of the capital. 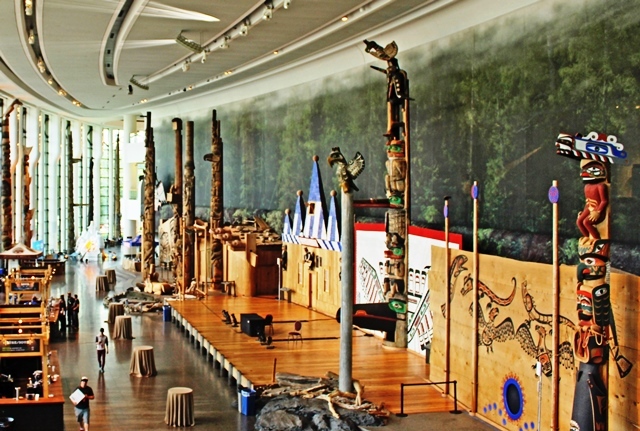 The lower floor has a large collection of First Nations totems and many artefacts telling the story of the people who lived in this country well before the first travellers arrived. Unfortunately, the renowned Canadian History Hall was closed in preparation for the Canada 150 opening on July 1st but I am sure it is fascinating. 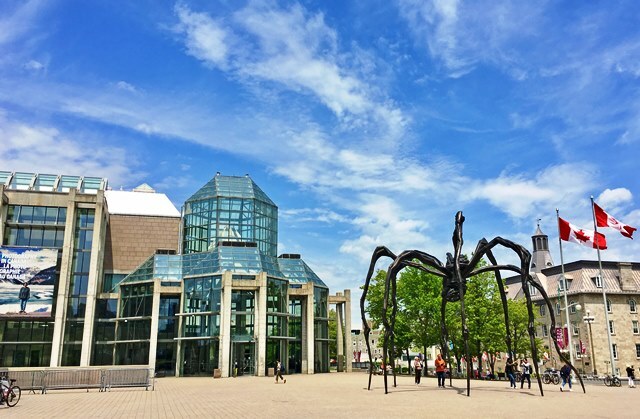 A ginormous spider lurks in front of the National Gallery of Canada, quirky monument to the country’s artistic spirit. Towering 30feet above the street, Maman, was made by Louise Bourgois from steel and marble. Inside the beautiful glass museum is a comprehensive collection of Canadian artworks. ‘The National Gallery of Canada strives to provide Canadians with a sense of identity and pride in Canada’s rich visual arts heritage and to make art accessible to all.’ I especially enjoyed the Indigenous Art Galleries, where intricate antler carvings are beautifully displayed next to simple images of wildlife and people. One of the most famous products of Canada is maple syrup. 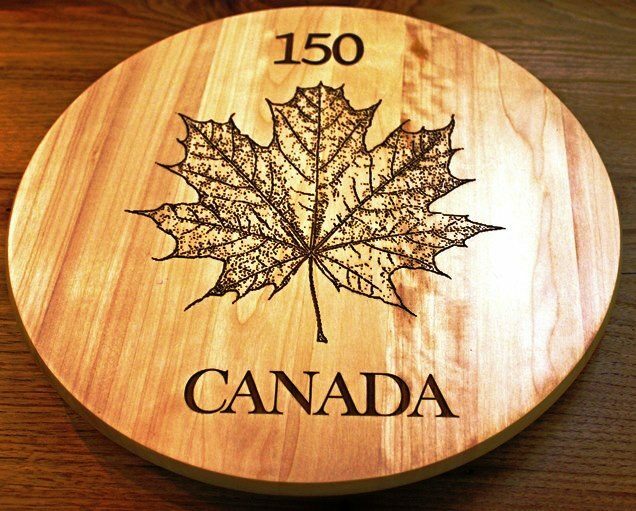 The Maple Leaf features on the Canadian Flag and the trees can be found all over Ottawa as well as in many other parts of the country. I learnt all about maple syrup production at Fulton’s Pancake House and Sugar Bush, a couple of hours’ drive from the capital. (Watch video at the end of this articel. 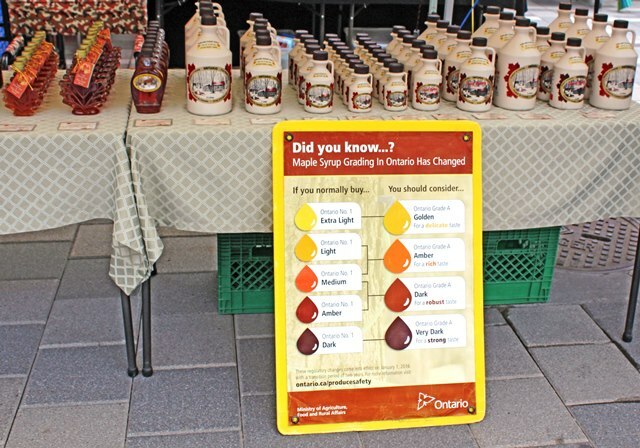 There are shops selling this luscious syrup all over the city and at Lansdowne Park Market I found a stall not only selling it but also explaining the changes in labelling that have recently been brought in. So what has Barack Obama got to do with Canada 150? Well, when he was USA President he visited Ottawa and called into the Moulin de Provence bakery in downtown Byward Market. 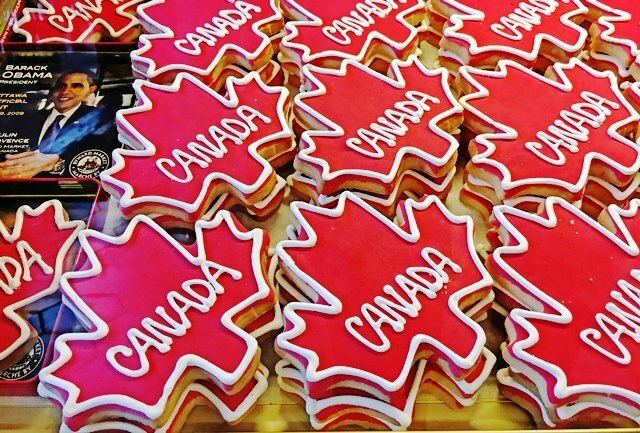 He bought one of their iced maple leaf cookies. The bakery was very savvy in its marketing them as ‘Obama Cookies’ and now every visitor to city has to try one of these iconic biscuits. Of course, I bought one in a commemorative tin to bring home. One of the greatest Canadian engineering feats of the 19th century, the Rideau Canal, a UNESCO World Heritage Site, flows through Ontario, finally cascading out into the Ottawa River. Constructed to aid British military operations against a possible American invasion, it was opened in 1832 and is 22km long. 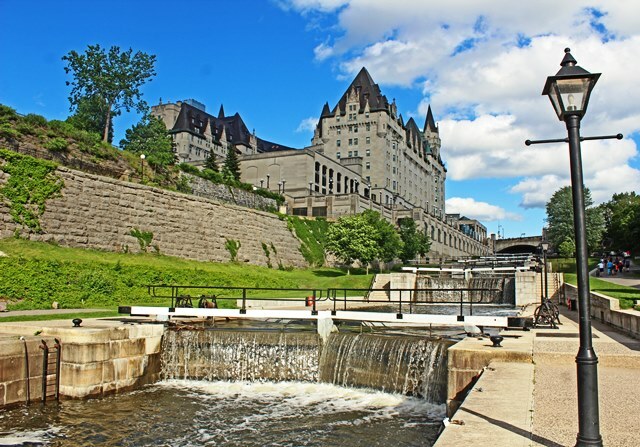 It’s the oldest continuously operated canal system in North America and the name comes from the French for ‘curtain’ due to its appearance in the lock system in front of the Chateau Laurier. This famous hotel opened in the early 20th century and was another of the railway hotels that spread across Canada as the trains brought the modern world to this enormous country. I can highly recommend the cocktails in Zoe’s Bar! 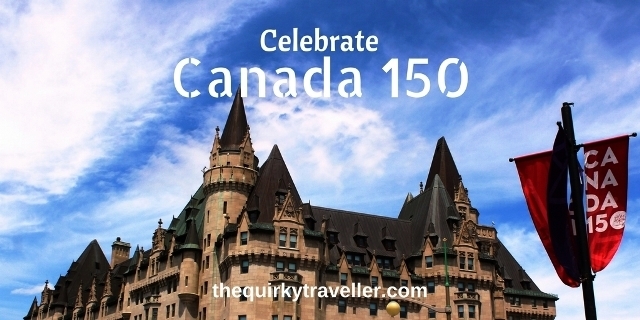 I travelled to Canada with Air Transat courtesy of Destination Canada with a group of 13 other fab UK travel bloggers visiting 14 cities in celebration of Canada 150. I stayed at the very cool Andaz Ottawa in Byward Market. Many thanks to everyone at Ottawa Tourism and the lovely Canadians for making me so welcome. If you enjoyed this celebration of Canada’s birthday do share it with others and leave a comment at the end of the post. If you have any tips or stories about Canada, please share those too! Looking forward to hearing all about everyone’s different adventures. I had a wonderful time in Saint John, New Brunswick. Longing to go back already! Thanks for your tips before I went Heather and for the introduction to Cindy Barker, Travel Bliss Now Travel Blogger. I can see why you like the capital so much. Thank you for the birthday wishes! Great roundup and photo of some beautiful spots in lovely Ottawa. So glad you enjoyed your stay. We had quite a party on July 1st, but, as you say, it continues all year long! I certainly did Karen 🙂 It was a real treat to visit Ottawa just before their big birthday bash. 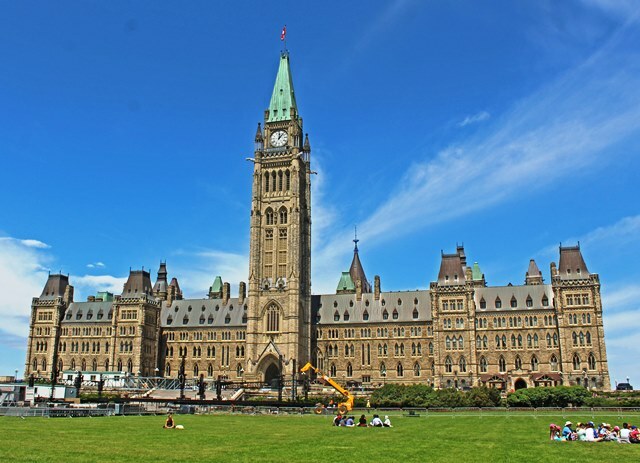 The capital has some many impressive national treasures as well as local and regional sights. Well worth a visit. I wouldn’t like to meet that spider up close! Looks like the one in the Harry Potter books. You shot some lovely photos while in Ottawa. There are a number of museums I’m looking forward to visiting there at some point. Thanks for the pointers for visiting the city. Great read Zoe, I love the beautiful architecture they have there which you’ve captured beautifully in your photos!